Tied to it is a scarf from Hobbs, which I will post about soon. I don’t think you can buy this actually, but the bright splodge of orange looks ace with the purple leather, and orange is the colour of the year apparently! Theres the usual array of notebooks, diaries, Moo cards and pens and paper, and my iPad is usually in here, but it was on charge at the time. I always have to have a camera in my bag (inside the gold bow case) and the essentials – purse, work badges, umbrella, tea mug, hair brush. Surprisingly, I have a make up bag in here at the moment. Actually putting the make up on in the morning is another thing. 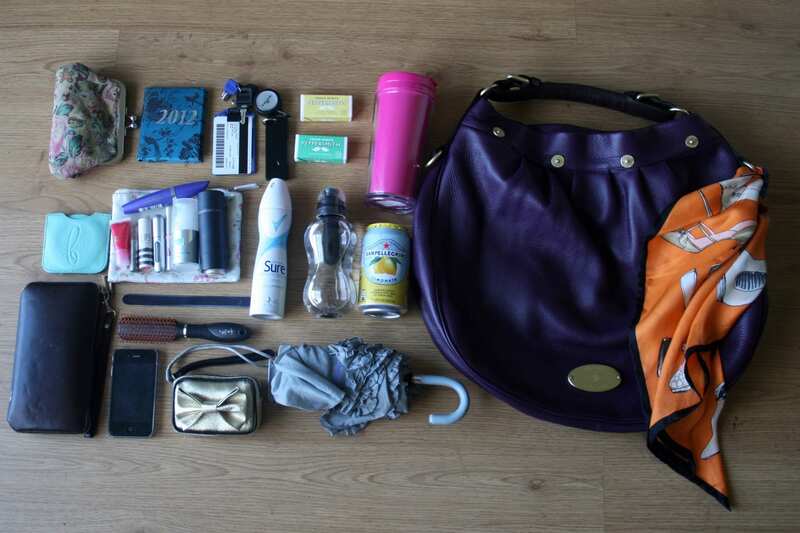 What do you keep in your bag – what can’t you live without?